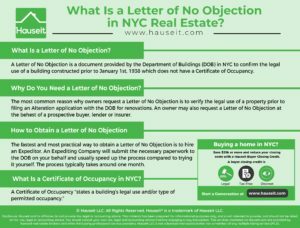 A Letter of No Objection in NYC is used to verify the legal use of a building constructed before January 1st, 1938 which does not have a Certificate of Occupancy on file with the DOB. Properties built in NYC prior to 1938 were not required to have Certificates of Occupancy. The most common reason for requesting Letter of No Objection is to verify the legal use of a property prior to filing an Alteration application with the DOB for renovations. If you’re selling or buying a property built before 1938, it’s important to note that you are not necessarily required to have a C/O or a Letter of No Objection on file in order to close. This is because standard contract of sale in boiler plate language states that the seller will deliver at closing either a valid Certificate of Occupancy or a letter stating that one is not available. 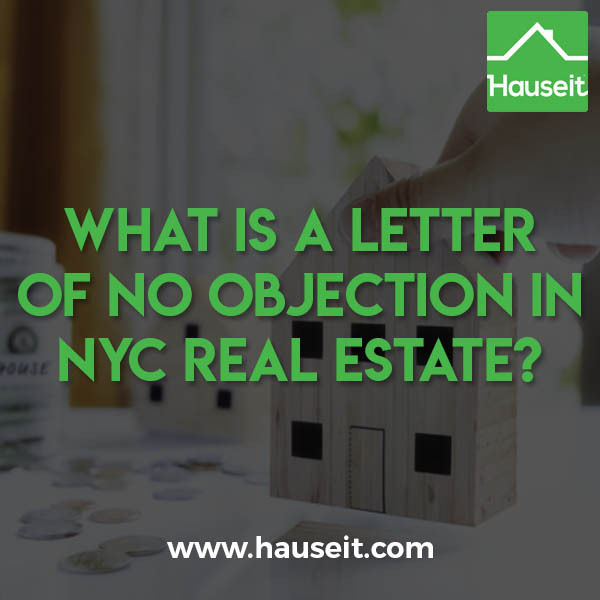 Why Do You Need a Letter of No Objection? 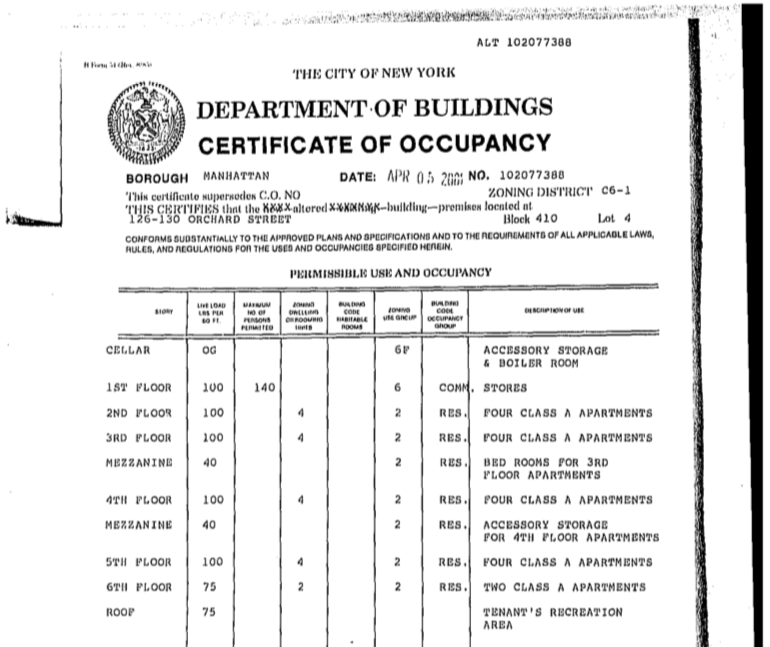 What Is a Certificate of Occupancy in NYC? Is a Certificate of Occupancy Required to Sell a Property in NYC? What Is a Letter of No Verification? 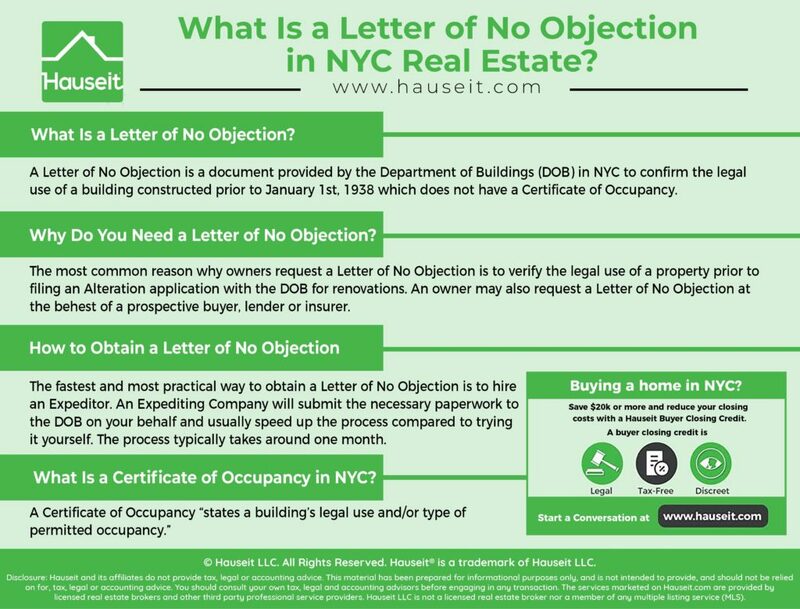 A Letter of No Objection is a document provided by the Department of Buildings (DOB) in NYC to confirm the legal use of a building constructed prior to January 1st, 1938 which does not have a Certificate of Occupancy. Reasons for requesting a Letter of No Objection (LNO) include: determining the legal use of a property prior to filing a renovation application and satisfying a possible requirement or request from a lender, insurer or prospective buyer. You may also request a Letter of No Objection if your property has a Certificate of Occupancy but the property has a different use than what is stated on the C/O or outlined in any applicable records. For a Letter of No Objection to be issued, the proposed or actual use of the property must belong to the same ‘Use Group’ as outlined by the Zoning Resolution. It must also have the Occupancy Group (OG). The most common reason why owners request a Letter of No Objection is to verify the legal use of a property prior to filing an Alteration application with the DOB for renovations. A seller may also request a Letter of No Objection at the behest of a buyer who wants to verify the legal use of a property. Another reason why you may require a Letter of No Objection is to satisfy requirements from a lender or insurer. Because properties in NYC built before January 1st, 1938 do not have a Certificate of Occupancy, it’s extremely common to come across listings which do not have a CO.
You are not necessarily required to have a C/O or a Letter of No Objection on file in order to close, however it’s a good idea to check with your lender, insurer and real estate attorney. The fastest and most practical way to obtain a Letter of No Objection is to hire an Expeditor. An Expediting Company will submit the necessary paperwork to the DOB on your behalf and usually speed up the process compared to trying it yourself. The process of applying for a Letter of No Objection through an Expeditor typically takes around one month. As per NYC Buildings, a Certificate of Occupancy “states a building’s legal use and/or type of permitted occupancy.” All new buildings are required to have a CO. Existing buildings are required to have a CO whenever there is a change in use, egress or type of occupancy. For buildings constructed after January 1st, 1938, no occupancy is permitted until a valid Certificate of Occupancy or Temporary Certificate of Occupancy has been issued. Not necessarily. 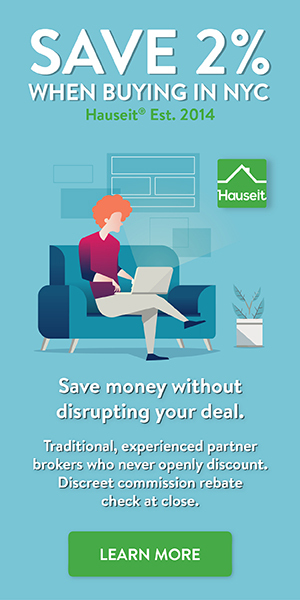 As a seller, you may be asked by a prospective buyer to furnish a Letter of No Objection if your property was built before January 1st, 1938 and there is no CO on file with the Department of Buildings. You’re not necessarily required to provide the buyer with a LNO (Letter of No Objection), however this is something which a buyer may insist upon when negotiating. A Letter of Verification (LOV) may be requested by the DOB if a property has an existing Certificate of Occupancy (CO) but requires verification. NYC Buildings uses the same application form for both Letters of No Objection and Letters of Verification.